A Sampling Bee: Blount Fine Foods Asian-Inspired Bowls Review + Giveaway! 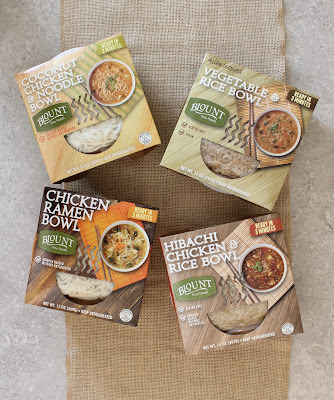 Blount Fine Foods Asian-Inspired Bowls Review + Giveaway! Welcome to A Sampling Bee! Today, I share with you Asian-Inspired Bowls from Blount Fine Foods! The Blount Family has been in the food business since 1880. Some of their first foods were frozen soups, sauces, entrees and side dishes. Recently, they released 4 Asian-Inspired bowls and they are delicious! If you're into trying new flavors and love easy meals, try Blount Bowls! Chicken Ramen Noodle- A comforting bowl of ramen noodles, chicken, shiitake mushrooms and scallions in a flavorful chicken broth with soy sauce and rice koji. Coconut Chicken & Noodle- A zesty bowl of ramen noodles, chicken and bamboo shoots in a coconut curry broth with lemongrass and cilantro. Hibachi Chicken & Rice- Sweet and roasted flavors of garlic, ginger, red onion and red peppers, simmered with tomatoes, chicken and long grain brown rice. Vegetable & Rice- A creamy coconut curry broth with lemongrass and cilantro, blended with long grain brown rice and packed with Asian vegetables including cabbage and bamboo shoots. Blount Bowls contain chicken that is raised without antibiotics. The bowls do not contain any MSG or trans fats. These Asian-inspired bowls are gluten-free and vegetarian/vegan. Blount Bowls do not contain any yucky ingredients. Blount Bowls' calories, sugar content and sodium levels vary. See packaging for more details. Blount Bowls come ready-to-eat so they are perfect for on-the-go. The noodles/rice for the broth come separately and can be added into the broth if desired. I added the noodles or rice to my soups because I enjoy eating my with a little starch. I was impressed by how easy it was to prepare a Blount Bowl. And, it's hot and ready in under 3 minutes! The four soups each have a unique, awesome flavor. I really enjoyed the Chicken Ramen Noodle and the Vegetable & Rice. I love the bowls because the ingredients are all natural and healthy. The soups are loaded with healthy veggies and antibiotic free chicken. Each bowl is less than 400 calories. Blount Bowls make a great lunch or dinner! Blount Bowls allow you to try Asian-inspired soups in just three minutes! The new bowls are available in the deli section at select Target, Giant, Giant Eagle, Hy-vee, Weis, Big Y and Stop & Shop. Visit their store locator. I received Blount Bowls in exchange for my honest review. All opinions are my own. Always! Enter to win! 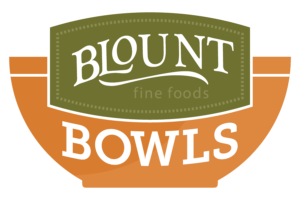 5 free Blount Bowl coupons and a Tea Towel! 5 WINNERS! US only, please. Entries will be verified! Good luck!! I'd like to try the Coconut Chicken & Noodle. I would love to try the Hibachi Chicken & Rice. I am loving the flavors that you have here! They're really awesome, and it's good to have them in the pantry in case you need a quick meal! That was a great food from Blount fine foods. I've tried Blount products but not these so these are kinda new to me. I would love to try all of these especially Chicken Ramen Noodle. That was a great food from Blount fine foods. I've tried blount before buty not these. So this is kinda new to me. I would love to try all of thes especially Chicken Ramen Noodle. I think I'd like to try the coconut chicken - but honestly, all the flavors look pretty good to me! I'd like to try Hibachi Chicken and Rice Bowl. It sounds delicious. I have never heard of Blount before but I'll have to take a look see taste here soon. I love that they have been cooking since 1880's. Those years draw me in. This looks great. Would love to try this too. Good luck on the giveaway!